Paul Hentzner, who was in England at the end of the reign of Elizabeth, remarks of the people whom he saw that "they are more polite in eating than the French, devouring less bread, but more meat, which they roast in perfection. They put a good deal of sugar in their drink." In his "Court and Country," 1618, Nicholas Breton gives an instructive account of the strict rules which were drawn up for observance in great households at that time, and says that the gentlemen who attended on great lords and ladies had enough to do to carry these orders out. Not a trencher must be laid or a napkin folded awry; not a dish misplaced; not a capon carved or a rabbit unlaced contrary to the usual practice; not a glass filled or a cup uncovered save at the appointed moment: everybody must stand, speak, and look according to regulation. The books of demeanour which have been collected by Mr. Furnivall for the Early English Text Society have their incidental value as illustrating the immediate theme, and are curious, from the growth in consecutive compilations of the code of instructions for behaviour at table, as evidences of an increasing cultivation both in manners and the variety of appliances for domestic use, including relays of knives for the successive courses. Distinctions were gradually drawn between genteel and vulgar or coarse ways of eating, and facilities were provided for keeping the food from direct contact with the fingers, and other primitive offences against decorum. Many of the precepts in the late fifteenth century "Babies' Book," while they demonstrate the necessity for admonition, speak also to an advance in politeness and delicacy at table. There must be a beginning somewhere; and the authors of these guides to deportment had imbibed the feeling for something higher and better, before they undertook to communicate their views to the young generation. There is no doubt that the "Babies' Book" and its existing congeners are the successors of anterior and still more imperfect attempts to introduce at table some degree of cleanliness and decency. When the "Babies' Book" made its appearance, the progress in this direction must have been immense. But the observance of such niceties was of course at first exceptional; and the ideas which we see here embodied were very sparingly carried into practice outside the verge of the Court itself and the homes of a few of the aristocracy. There may be an inclination to revolt against the barbarous doggerel in which the instruction is, as a rule, conveyed, and against the tedious process of perusing a series of productions which follow mainly the same lines. But it is to be recollected that these manuals were necessarily renewed in the manuscript form from age to age, with variations and additions, and that the writers resorted to metre as a means of impressing the rules of conduct more forcibly on their pupils. 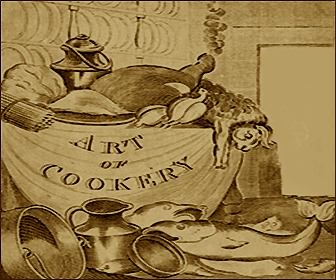 Of all the works devoted to the management of the table and kitchen, the "Book of Nurture," by John Russell, usher of the chamber and marshal of the ball to Humphrey, Duke of Gloucester, is perhaps, on the whole, the most elaborate, most trustworthy, and most important. 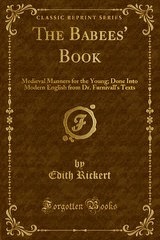 It leaves little connected with the cuisine of a noble establishment of the fifteenth century untouched and unexplained; and although it assumes the metrical form, and in a literary respect is a dreary performance, its value as a guide to almost every branch of the subject is indubitable. It lays bare to our eyes the entire machinery of the household, and we gain a clearer insight from it than from the rest of the group of treatises, not merely into what a great man of those days and his family and retainers ate and drank, and how they used to behave themselves at table, but into the process of making various drinks, the mystery of carving, and the division of duties among the members of the staff. It is, in fact, the earliest comprehensive book in our literature. The functions of the squire at the table of a prince are, to a certain extent, shown in the "Squire of Low Degree," where the hero, having arrayed himself in scarlet, with a chaplet on his head and a belt round his waist, cast a horn about his neck, and went to perform his duty in the hall. He approaches the king, dish in hand, and kneels. When he has served his sovereign, he hands the meats to the others. We see a handsome assortment of victuals on this occasion, chiefly venison and birds, and some of the latter were baked in bread, probably a sort of paste. The majority of the names on the list are familiar, but a few—the teal, the curlew, the crane, the stork, and the snipe—appear to be new. It is, in all these cases, almost impossible to be sure how much we owe to the poet's imagination and how much to his rhythmical poverty. From another passage it is to be inferred that baked venison was a favourite mode of dressing the deer. The precaution of coming to table with clean hands was inculcated perhaps first as a necessity, when neither forks nor knives were used, and subsequently as a mark of breeding. The knife preceded the spoon, and the fork, which had been introduced into Italy in the eleventh century, and which strikes one as a fortuitous development of the Oriental chopstick, came last. It was not in general use even in the seventeenth century here. Coryat the traveller saw it among the Italians, and deemed it a luxury and a notable fact. The precepts delivered by Lydgate and others for demeanour at table were in advance of the age, and were probably as much honoured in the breach as otherwise. But the common folk did then much as many of them do now, and granted themselves a dispensation both from knife and fork, and soap and water. The country boor still eats his bacon or his herring with his fingers, just as Charles XII. of Sweden buttered his bread with his royal thumb. Before meat; and when thou dost arise." Other precepts follow. He was not to speak with his mouth full. He was to wipe his lips after eating, and his spoon when he had finished, taking care not to leave it in his dish. He was to keep his napkin as clean and neat as possible, and he was not to pick his teeth with his knife. He was not to put too much on his trencher at once. He was not to drop his sauce or soup over his clothes, or to fill his spoon too full, or to bring dirty knives to the table. All these points of conduct are graphic enough; and their trite character is their virtue. The country boor still eats his bacon or his herring with his fingers, just as Charles XII of Sweden buttered his bread with his royal thumb. 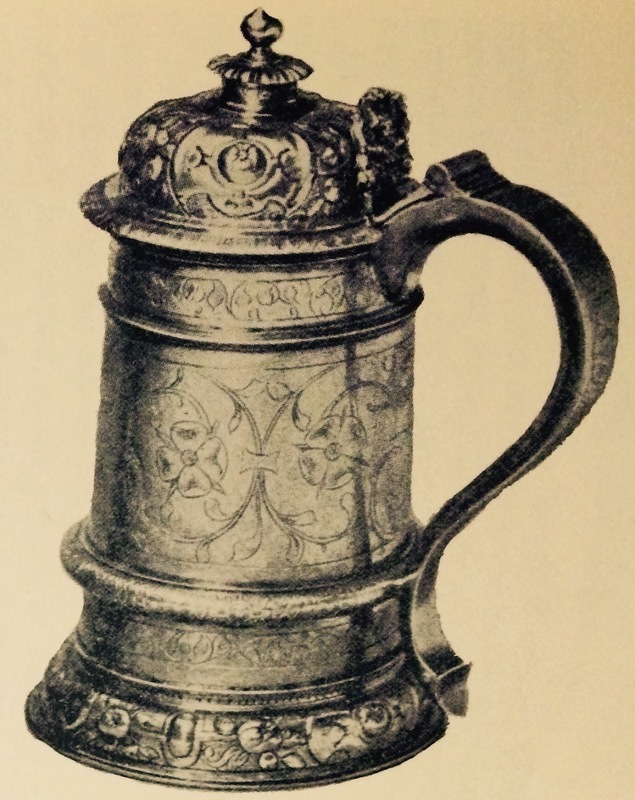 Boiled, and perhaps fried meats were served on silver; but roasts might be brought to table on the spit, which, after a while, was often of silver, and handed round for each person to cut what he pleased; and this was done not only with ordinary meat, but with game, and even with a delicacy like a roast peacock. Of smaller birds, several were broached on one spit. 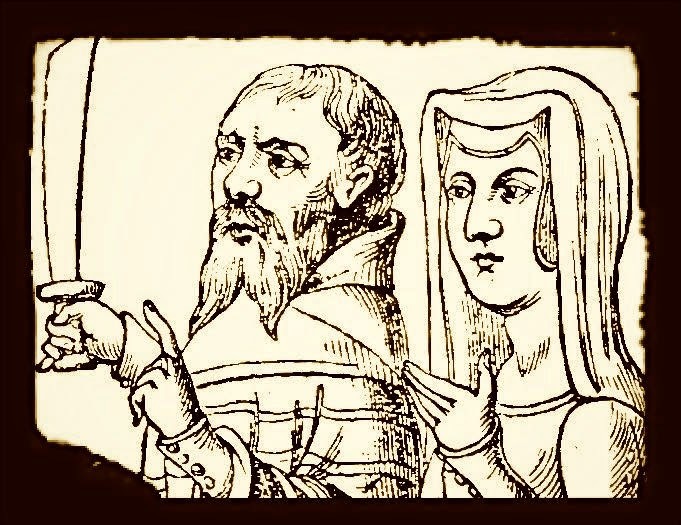 There is a mediaeval story of a husband being asked by his wife to help her to the several parts of a fowl in succession, till nothing was left but the implement on which it had come in, whereupon the man determined she should have that too, and belaboured her soundly with it. At more ceremonious banquets the servants were preceded by music, or their approach from the kitchen to the hall was proclaimed by sound of trumpets. Costly plate was gradually introduced, as well as linen and utensils, for the table; but the plate may be conjectured to have been an outcome from the primitive trencher, a large slice of bread on which meat was laid for the occupants of the high table, and which was cast aside after use. Bread served at table was not to be bitten or broken off the loaf, but to be cut; and the loaf was sometimes divided before the meal, and skilfully pieced together again, so as to be ready for use.